Brazil is being rocked by a deep political and economic crisis that has brought Dilma’s government to the brink of collapse. In a desperate measure, Dilma brought back the former president, Lula, as a “super minister” in her government, to attempt to shield him from corruption allegations. In the recent period, the political crisis has deepened together with the economic crisis. Last year, Brazil’s GDP fell by 3,8% and forecasts point to a similar performance this year, adding up to the steepest GDP fall over two years in the history of the country. Dilma tried to maintain the appearance of a successful economy up to the elections of October 2014. Even so she only won the second round of the presidential elections by a small margin against the right wing candidate Aécio Neves (PSDB) by using left rhetoric. But right after the elections she started to implement the very same neoliberal attacks that she accused her opponent of intending to do. This led to a steep fall in popularity, aggravated by the worsening economy, with 1.5 million jobs lost last year and double-digit inflation, and the on-going revelations in the huge investigation into corruption in the state oil company, Petrobras. The investigations, under the name “Operation Car Wash”, have lead to the imprisonment of dozens of politicians and the top executives of the biggest construction companies. Late last year, senator Delcídio do Amaral, from the PT (“Workers’” Party of Dilma and Lula), was jailed for his participation in the scandal. He is the first serving senator in history to go to jail. Feeling abandoned by the party, he made an agreement to give more information in exchange for a lighter sentence, involving many top politicians, including Lula and Dilma. His revelations were leaked to the press the day before Lula was brought by police to interrogations, accused of receiving kick-backs from construction companies. This events rocked the political scene and came just a few days before a planned “day of action” organised by right wing groups calling for impeachment against Dilma on Sunday 13 March. Similar protests were held several times last year, the biggest being the first one on 15 March, involving millions. But these protests on 13 March this year were even bigger. According to Datafolha, a research group linked to the biggest bourgeois daily paper, Folha de São Paulo, the protests were the biggest in the history of the country, with millions taking to the streets. The composition of the demonstrations was mainly middle-class: white people, with high wages and university degrees, and with a high average age. The leadership of the demos was clearly right wing and neoliberal. 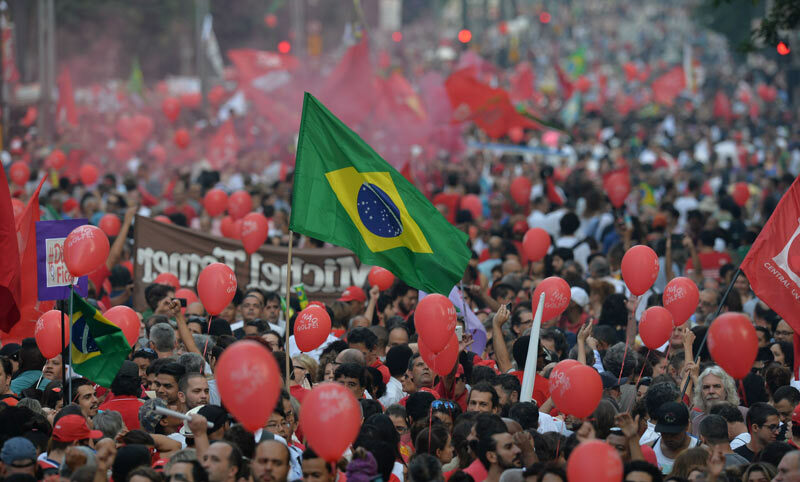 The participants shared a very strong stand against the PT, Dilma, Lula and “corruption” in general, but few knew what alternative they supported. Right wing politicians like Aécio Neves (who called on people to participate on TV and who most people on the demos had voted for in 2014) and Geraldo Alckmin (São Paulo’s state governor, also from PSDB), had to leave the demo in São Paulo without making any speech after being booed at. A minority on the demos called for the military to intervene. Even if the majority didn’t support that, those reactionary views were tolerated. In the capital Brasília, the reactionary MP Jair Bolsonaro received huge applause, because he is seen as more of an outsider, in a similar way to Donald Trump (but with less support). It was in this situation that Dilma invited Lula into her government. This was supposed to serve a double purpose. Firstly, Lula has a big influence and could help guarantee the blocking of the process of impeachment in congress, where Dilma’s coalition with is very shaky now, due to the deep crisis. Secondly, Lula as a minister would escape from the local judge in charge of Operation Car Wash, Sergio Moro, and could only be investigated by the Supreme Court. But the announcement of Lula’s appointment as minister has led to more protests and a very tense situation in the country, with the corporate media rallying against the government and pro-government groups mobilising against a “coup d’état” and “fascism”. On Friday 18 March, the pro-government forces held demos all around the country. Apart from the usual grab for power between the parties, there has been an important shift in the position of the capitalist class towards Dilma’s government. In August last year, when the threat of impeachment was posed more concretely, as the corrupt speaker of the Chamber of Deputies was using the threat to save his own skin, important representatives of the capitalist class spoke out against impeachment. The industry bosses’ federation in São Paulo and Rio de Janeiro, the editorial of the two biggest papers and the presidents of the two biggest private banks. They did so as they knew that an aggravation of the political crisis would deepen the economic crisis. But now they all say that Dilma must go. The loss of support for Dilma’s government from the ruling class is not due to supposed left wing positions. To the contrary, Dilma has tried to find a way out of the crisis by moving to the right, launching more attacks in the last period. The government launched and got through congress an anti-terrorist law that criminalises social movements. It also negotiated with the right wing a proposal that increases private investment in the vast deep-sea oil reserves. The government also announced plans for a new pension reform that increases the retirement age and a neoliberal cap on public expenditure that triggers automatically cuts in wages for public servants and minimum wages. The problem for the ruling class is that the government lost all capacity to implement those attacks. Lula’s early comeback (he is planning to run for the presidency again in 2018) is to try and save what is left of the government and restore the capacity to implement those austerity measures, even if some probably will be dropped, such as the pensions reform, to give some fig leaf to maintain support from pro-government trade unions and social movements which have been increasingly (under pressure from their rank and file) against those measures. But the situation is very unstable and it’s not even assured that Lula will be able to take office. The day it was announced that he accepted the ministry position, the judge in charge of Operation Car Wash released all phone recordings of Lula, including calls from Dilma, giving details of Lula’s conversations. A local judge in the capital Brasília issued a decision to block Lula from taking office and the Supreme Court received many petitions to block Lula, claiming that he is trying to escape justice. Brazil is going through a process of social polarisation, in the wake of the undermining of the position of the PT. In 2013 we saw an explosion of protests from the youth, which lead a new generation of fighters onto the arena of struggle. There was an upsurge of strikes, occupations and protests, which still can be seen. At the end of last year, over 200 schools were occupied in São Paulo, in a movement that managed to stop school closures. In Rio de Janeiro there is a strong strike of teachers and school staff against the attacks of the state governor. But those struggles have been fragmented and have not lead to the surging of a big left alternative. PSOL, the broad left party that LSR (CWI in Brazil) take part in, has grown in the elections, but is still a small factor. The electoral system in Brazil is dominated by big money and right wing politicians have been strengthened in the polarised situation. And in this current crisis the right wing has the initiative and has managed to bring millions onto the streets. But even among the layer of the middle class that marched on 13 March, a strong left alternative could win support, but the left is still small and fragmented. Some on the left thinks that the main task now is to support the government against the threat of a “coup” or “conservative tide wave”. Others raise slogans like “down with all” and are satisfied with making a stand, but without trying to open a dialogue with a wider layer of workers. LSR (CWI in Brazil) argues that the solution to this crisis must be sought from outside the rotten institutions of the state, in the struggles and in the streets. We reject all solutions of the right wing, like an impeachment that hands over the presidency to Dilma’s vice president from the bourgeois PMDB, or a government reshuffling that has the objective of restoring the capacity of the government to implement austerity measures. We have no illusions in the right wing opposition of PSDB, or state institutions, like the judiciary which is playing an increasingly political role. PSOL and other left parties must together with combative trade unions and social movements build a left front that can build a left alternative in the struggles and coming elections. Brazil: The Resistance Begins Now! Against Bolsonaro, Defend Democratic Rights, and Smash the Pension Reform!